TNB Night Owl – Banzai! HomeFeatureTNB Night Owl (Open thread)TNB Night Owl – Banzai! Japanese movies have a history of being revised for American audiences. The Grudge, The Ring and even the Lion King drew heavily from preceding Japanese works. In 2001, however, Fox executives decided to import a Japanese game show. Or, perhaps more accurately, they decided to import the general feel of a Japanese game show without bothering with any of the messy linguistic and cultural translation issues. Thus, Banzai! was born. A game show in which challenges were explained, viewers were instructed to call in with their guesses as to how a challenge would end, and then the recorded clip would run. In theory, people who consistently guessed correctly would be rewarded with recognition on the show. Rather than import Japanese footage, American and British actors of Japanese heritage were used for all of the repeating roles. Broken, heavily accented English was used to simulate a foreign feel to the show. Here’s an episode that includes Lady One Question (who would ask one question, then wait for the person to get uncomfortable and walk away… bets were placed on how long it would take) questioning Simon Cowell, and a visit from Dr. Who. It ran for two years in the U.K., and the challenges created were consistently odd. After a rocky couple of years in the ratings, the show was shut down and restarted in a place much more amenable to oddity: the United States. Here are some clips from the US edition. The new, American Banzai debuted on Fox in 2003… and ended on Fox in 2003. 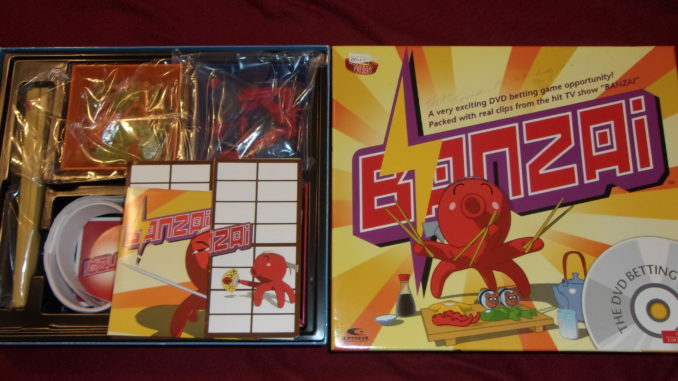 The show was ended before they’d even used all of their existing footage, so the unused film was loaded onto a DVD, put together with a plastic sushi bar and marketed as the Banzai DVD Betting Game… packed with real clips from the hit TV show “Banzai”. “Hit”, in this case, is a very malleable term. Oh, and should anyone wonder, that faint of writing above the game blurb in the image used in the photo for this story? That’s the autograph of one of the people to play Mr. Shake-Hands Man. Because my family doesn’t just have the game, we surprised one of the stars with a copy of it at a signing session. Question of the night: Who are one or two of the “celebrities” you’ve encountered?